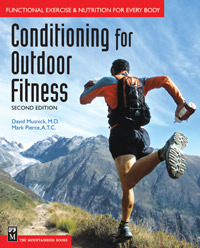 Written by an MD in sports medicine, this book goes into exercise physiology, aerobic training, strength, balance, stretching, injuries, injury prevention, and specific training for various outdoor activities. Specific chapters go into, hiking, backpacking, rock climbing, mountaineering, kayaking, etc. This is an excellent book that goes beyond traditional exercise books into physiology of excercise, yet it is accessible to the layman.